Continuing their celebration of Luciano Pavarotti's career on record, Decca Classics have released this DVD of the late tenor in a performance of Un ballo in maschera from the Met. Predating Deutsche Grammophon's release of the same tenor in a later production of the same opera by ten years, it finds Pavarotti at the peak of his vocal talents and is worth every penny of the cover price just to hear him in such electrifying voice. The cavatina and stretta to the first scene, the taxing conclusion to the second scene and the full aria in the third act are all astounding for the way in which the great singer awards equal amounts of emotion and technique to them; I can't remember a more shatteringly intense account of the Amelia-Riccardo duet in a filmed performance. Katia Ricciarelli, too, is at her prime in the role of Amelia. Although she was never the most reliable of singers and was apt to push her voice beyond its limits in the 1980s by singing heavy parts such as Turandot, here Ricciarelli combines a nobility of demeanour with an irresistible passion. 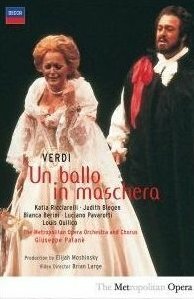 The pathos she brings to 'Morrò, ma prima in grazia' makes it one of the highlights of the performance, while her second-act aria is similarly fine, delivered with a sense of purpose that promotes the believability of Amelia's courage (something that other sopranos sometimes struggle to portray). However, other aspects of this DVD are more than problematic. First and foremost, the atrocious quality of the picture means that it can be very difficult to make out some aspects of Peter Wexler's sets for Elijah Moshinsky's production. Moshinsky uses the revised Boston version of the piece, but apart from the frequent Union Jacks and a couple of maps and portraits there are very few indications of location. Dramatically, at least, there's not much atmosphere about the DVD other than in close-ups of the two leading singers' faces. I can't remember a less affectingly staged closing scene: there's no feeling of arrival and departure, of the lurking conspirators or of the lovers' conversation taking place in front of a whirling ballroom of people. On the other hand, the primitive filming techniques mean that we can't always see as much of the stage as we need to; nor does the blurred picture allow us to see enough detail. Nevertheless, I think it's clear that neither the settings nor the direction are especially inspired: screens tend to make do as walls; there are only a few bits of furniture in both the Governer's mansion and Renato's house; and both Pavarotti and Louis Quilico (an efficient but rather stolid and wooden Renato) have a tendency to stand at the front of the stage and sing out to the audience as if delivering a bel canto concert rather than a hot-blooded opera. The sound quality, too, is dubious. Decca have cleaned up the soundtrack to a certain extent, so that the orchestra often sounds vibrant and detailed in the imposed DTS 5.1 surround sound, but the chorus is bizarrely muted in the final scene despite being at the front of the stage. Judith Blegen's Oscar is also quite hard to hear in the opening scene, coming into her own in her crisply-sung solo of the last act, where she is more audible; to my ears, Bianca Berini is a disappointingly thin-toned and dramatically underwhelming Ulrica, but again she may be ill served by the quality of the tape in the former quality. Giuseppe Patanè conducts a generally secure account of the score, showing more sympathy to the soloists than the general ensemble, who are sometimes hard pushed by slightly excessive tempos. Short but enjoyable interviews with Pavarotti, Ricciarelli and Met Artistic Director James Levine reveal both amusing anecdotes (such as Ricciarelli's admission of mixing up the names of Riccardo and Gustavo - the lead tenor role in the opera's two versions - when performing it with Abbado) and useful insights (Levine's description of the genius of Verdi and Mozart as a combination of 'having an idea and knowing what to do with it'). In short, this is probably a 'must-have' for fans of Pavarotti and Ricciarelli. But various other versions on DVD - not least the better-filmed, performed and produced 1990 Met version - remain far more secure 'benchmark' recommendations.